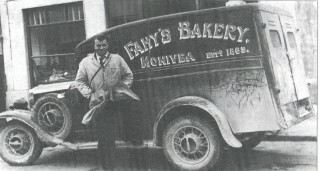 Fahy's Bakery delivery van, Monivea. Up until the 1960s Monivea had it’s own Bakery. The bakery was originally Fahy’s Bakery but became Cookes at a later stage. The bakehouse and the large ovens are still intact there today. A young Pat Higgins from Culmore, Kilkelly, Co. Mayo arrived to learn the baking trade at Fahy’s Bakery and it was from here, in 1953 at the age of 30 that Pat, having finished his apprenticeship, cycled one Sunday morning to Granard in Co. Longford to open his own bakery there. 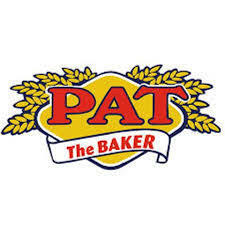 It went on to become one of the most well known bakeries in Ireland today trading as Pat The Baker. His family still have the bicycle he used to get from Monivea to Granard on display in the bakery in Granard. Pat passed away in August 2007 at the age of 84.